MVP Roofing - Large or Small we are here to help with your project. We Offer Residential and Commercial Roofing at a Fair Price! MVP offers reputable contracting in Roofing, Construction, Painting and Flooring (commercial, residential, interior and exterior) for: Denver, Colorado Springs, Aurora, Fort Collins, Lakewood, Thornton, Arvada, Westminster, Pueblo, Centennial, Boulder, Greeley, Longmont, Loveland, Broomfield, Castle Rock, Commerce City, Parker, Littleton, Northglenn, Brighton, Englewood, Wheat Ridge, Fountain, Lafayette, Windsor, Evans, Erie, Golden, Louisville and more. MVP Roofing Contractors provide prompt, efficient, and detail-oriented roofing professionals to tackle any roofing project. Our residential and commercial roofing experts will thoroughly assess, plan and execute the perfect roof remodel, repair or installation on your next roofing project. Our 5 year craftsmanship guarantee will give you that extra peace of mind. See all of our services below. We pride ourselves as being the best of the best when it comes to roofing. We have been doing business in the Denver CO. area for over 20 years, this should give you a good idea we know what it takes to get the job done as well as take care of you the customer. Here is what you can expect from our services we offer! A FREE Detailed Proposal. You will know exactly what our work will entail, what materials we will be using on your roof, and how much it will cost before we start your roofing project. Communication. Email, cell phones help us connect with you to keep you informed on the status of your roofing job and answer any questions or concerns that arise during the process. Satisfaction. We will not ask you for any money until the job is complete and you are totally satisfied with our work. We are confident in our ability to deliver a quality service. Professionalism. From our first call to final clean up, you will be dealing with professionals. We treat our customers as we would want to be treated. Full Worker Compensation and Liability Insurance. You don’t have to worry about lawsuits or claims against your homeowners insurance. Warranty. We offer a 5-year MVP Craftsmanship Guarantee with every roof we install and a 1-year Warranty on all leak repairs. With a history like ours, our warranty really means something. We also offer the GAF Golden Pledge 25-year warranty. Only the top 3% of roofing contractors in the country can offer this warranty. By providing the Golden Pledge Warranty, we take the risk out of your roofing decision. You wouldn’t deposit your money in a bank that is not FDIC insured, why would you install a roof that wasn’t fully protect for the time you live in your house. High Quality Products. We only use the best roofing manufacturers and we install complete roof systems. We don’t use second hand materials or manufacturer’s rejects. Some Good Information to know about Roofing! Are the most common roof covering in North America. There are many different manufacturers and types of shingles. The two most common type of shingles are 3-tab or strip shingles and Architectural or Laminated shingles. There are also designer shingles that are made to look like wood shakes, slate, or tile. Shingles have many different colors and shadings. Energy Star rated shingles are available. What is a shingle made of? 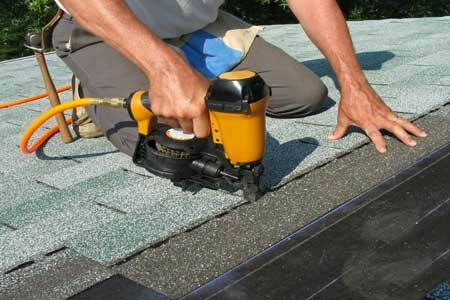 Asphalt shingle are made of a fiberglass mat, asphalt, and granules. The granules protect the asphalt from the sun’s UV rays and give the shingle the color. There is a sealant that help the shingles seal together. The better the sealant, the better the shingle can withstand high winds. Shingles are installed over the roof underlayment. Nails hold the shingle to the roof and are most commonly installed using pneumatic nail guns. There is a nailing area where the shingles are nailed to perform as they were designed. What are the key components of a shingled roof? The actual shingle is very important but as important is the rest of the roof system. The roof system includes the roof underlayment, leak barriers, starter strips, proper ventilation, and hip n ridge. Visit our roof system page for more information. How long will asphalt shingles last? If you replace your roof with an architectural shingle or designer shingle, you will most likely not be replacing the roof on your home again in your lifetime. 25-30 years barring any major weather event is a good expectation. For a 3 tab shingle, expect the roof to last 15-20 years. What is the cost of a shingle roof? The most economical shingle is the 3 tab shingle. Shingles in general tend to be the most affordable of all roofing choices. Designer shingles are the most expensive. What are the Warranties, in general terms? Most 3-tab shingles have a 25 year warranty and after 7 years, their value starts to pro-rate. Architectural shingles have a lifetime warranty. They will start to pro-rate after 10 years but will hold 10-15% of their value of the purchased price after 50 years. Hence, the lifetime warranty. So if the shingles fail after 25 years, expect to recover 50% of the cost of the shingles from when they were purchased. Only the cost of the material is covered. What is the GAF System Plus or GAF Golden Pledge Warranty? The GAF System Plus warranty and GAF Golden Pledge warranties are non-prorated warranties that cover 50 years. This covers only GAF architectural and designer shingles, not the 3 tab shingles. Even if they fail in year 35, GAF will replace the roof at the current cost of shingles and installation. This is why when you choose the GAF system warranty, whether it be the System Plus or the Golden Pledge, it will be the last roof you pay for. Think of it as an insurance policy for your roof. The best thing is you can transfer it to a new buyer if you decide to sell the house so you get the value from installing a Golden Pledge roof either way. Slate roofs are very heavy and only structures designed to hold the weight load can have slate installed. Slate is a natural product that is mined from the ground. Large quarries cut the slate shingles from large stones of slate. Most slate in the US comes from the Northeast, mainly Vermont. South America and China are other locations where slate comes from that is installed in the US. Slate is also recycled. Because it can last up to 120 years, there are instances where the slate roof outlasts the building. The slate is then removed and sold for use on other buildings. This type of recycled slate can be in demand because of the natural aging that can be hard to replicate. Slate is limited in the color and look. Slate can be installed with difference reveals giving it different looks. Many times different sized slate and different colors slate are installed together for a unique, one of a kind look. Slate roofs will last a long time. A quality underlayment, proper flashing, and quality installation are key to the longevity of a slate roof. The actual slate will last for a very long time. However, if it is installed poorly, it can be a waste of good material. The cost for slate and the labor to install is very costly. The cost to install slate or tile are similar. It is much more expensive than shingles. The tiles of a tiled roof can be made of concrete, clay, or plastic. Concrete and Clay can be very heavy and unless the roof is designed to hold the extra weight, you cannot install a concrete or clay tile roof. Clay and concrete tile roofs can last a very long time. We have removed 50 year old tile, installed new underlayment and re-installed the tile. Some tiles will last 100 years. If you don’t have the structure that can hold the weight of a concrete or clay tile, a plastic tile can be an option. Quarrix tile is a solution if you want the look of a barrel tile but your house currently has shingles and cannot hold the weight of a traditional tile. Tiles can come in all types of color and looks. The most common is a barrel tile with a terracotta color. This is a popular roof covering in Florida and the southwest. In many central American countries, this is the only roof type you will see. Cost for the material and installation is very expensive compared to asphalt shingles. Once again, the other components that go into the system and the actual installation are very key to this type of roof lasting 50, 70, or even 100 years. Quality underlayment’s, proper flashing and an experienced crew are extremely important. There are as many if not more metal roof options out there as asphalt shingle roofs. It is not common to have an entire residential roof covered in metal panels. There are 2 main type of metal roofs, exposed fasteners and concealed fasteners. Exposed fastener metal roofs are the most common type of metal residential roofs. This is because they are the most economical. The problem with an exposed fastener roof is the rubber gasket on the exposed screw will breakdown after 10-15 years and cause leaks. This can be a very costly repair. We will install concealed fastener or standing seam metal roofs. Metal roofing properly installed can last a long time. The color can fade but most quality roof panels come with a 20 year finish warranty against fading. Typically, only certain areas are covered with metal roofing, like bay windows, water tables, dormers, or porches. The metal is an accent usually with asphalt shingles as the main roof. A standing seam metal roof properly installed is typically 2-3 times the cost of asphalt shingles. An exposed fastener system can be 20-50% more than an asphalt shingle roof. Be wary of a metal roof price that is similar to an asphalt shingle roof. Most of the cost with any metal roof is the flashing and edge metal details. If the cost of a metal roof is as low as an asphalt shingle roof, it usually means short cuts will be taken during the installation. This will lead to costly repairs shortly after the roof is installed. There are many different types of low slope roofing materials. The most common types used in residential building are TPO and Modified Bitumen or rolled roofing. Typically rolled roofing is installed in 2 or 3 ply’s (layers). This can be costly for labor and materials. TPO is a single ply membrane. The seams are heat welded to form one continuous sheet of roofing. TPO is white and is highly reflective. Most residential low slope roofs are over a sunroom or at the very top of the house. MVP has been installing all types of low slope roofs for the past century. Our commercial experience gives us an advantage over most residential roofing companies. When it comes to residential low slope roofing, you won’t find a more experience and qualified company. Most homeowners never think about their roof, until it starts to leak. Roofs leaks can be caused by a number of reasons. The first sign of a roof leak is typically a water spot on the ceiling and other times there is enough water pouring in that a bucket is needed to catch the water. Regardless of why you have a leaky roof and how much water is coming in, it’s important to address the roof leak quickly. Some homeowners temporarily patch or cover a hole or tear in their roof with a big blue tarp and others aren’t sure where the roof is leaking from. No matter the reason, the best thing is to hire a professional roofing contractor. MVP Roofing has been fixing leaky roofs for a long time. Our experience and knowledge help us find the source of the leak quickly and accurately to stop further damage from occurring. There could be a number of reasons why your roof is leaking and various leaks will require varying repairs. Has there been a recent storm that has damaged your roof? Have high winds blown shingles off your roof? Has your aging roof already outlived its warranty? Do you have missing or damaged shingles you can see from the ground? Don’t neglect a leaky roof. Time will multiply the damage on the roof and damage could begin to accumulate inside your home as well. Moisture can wreak havoc on your attic and within your walls. Mold can grow and interior moisture damage could be expensive to repair. Sometime more expensive than the repairing the roof leak. There are many variables that go into determining the cause of the roof leak. The age of the roof, the design of the house, the brick or siding above the roof line, all could be factors into why there is a leak. Each situation requires its own repair solution. That is why it is important to hire an experienced, knowledgeable roofing professional. Most anyone can smear roofing cement or caulk to make a temporary repair. It’s important to get to the root cause of the leak and make a permanent roof repair. 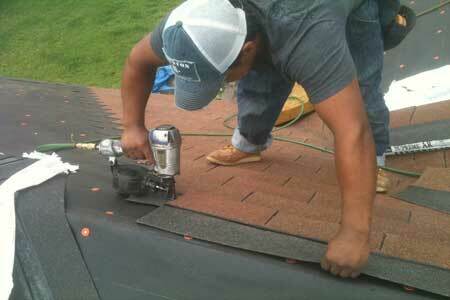 MVP Roofing has been fixing and replacing leaky roofs for a very long time. We will give you a free estimate to repair your roof leak. We back our repairs with a 1 year warranty. Contact us for help to determine the cause of your leak and a suitable solution to fix it quickly. We’ve saved countless clients money by fixing their leaks promptly and have also saved clients thousands by determining they just need a repair when they thought they’d need a whole new roof. We are happy to come out and assess the leak, provide a quote, and schedule the work. We are the best choice for your roof repair. MVP has skilled, trained, certified, insured, and focused roof installers with the experience to know how to repair any type of roof. We can repair metal roofs, shingle roofs, and flat roofs. MVP Roofing can also install chimney caps, seal brick chimneys, replace rotten siding, or repair wall flashings. Sometime just because the water is coming in from the ceiling, doesn’t mean it is a roof leak. It could be the brick, siding, or windows. That is why it is important to hire a residential roofing company with experience and knowledge to determine what is the source of the leak and make the correct repair. Don’t delay! If your roof leaks, call MVP Contractor. Fixing a leak now could extend the life of your roof and save you thousands of dollars in potential damage to your home and belongings. Golden Pledge Warranty – Taking the risk out of roofing. The GAF Golden Pledge Warranty is the best shingle roof warranty. Not only is it backed by GAF, North America’s largest shingle manufacturer, it also back by the Good Housekeeping Seal. This means that if there are any defects in the materials backed with the Seal, they will be replaced by Good Housekeeping if for some reason GAF will not be able to replace them. We offer the Golden Pledge Warranty with all our proposals as the Premium Option. System Plus Warranty – Adding Value to Your New Roof GAF’s System Plus Warranty covers the entire GAF Roof System, including the shingles, ridge vent, starter shingles, hip n ridge shingles and other GAF roof components that are installed on the roof. By opting for the System Plus, the non-prorated period lasts for 50 years. This is unbelievable considering most shingle warranties start to decrease their coverage by prorating their shingles after 10 years. The graphs below show how installing a new roof with either the System Plus or Golden Pledge add value to your roof. The great thing is, you can transfer the warranty to a new home buyer. So even if you don’t get the full value of the warranty, this warranty can be a very helpful when you sell your home. Have questions about the warranty or need more information. Visit GAF’s website to learn more about their warranties. Good Housekeeping Protection on Roofing System? We know you have choices when it comes to picking a good dependable Roofer or Contractor. MVP has been in business a long time, we do not believe in pressuring the customer is a good tactic, granted we do look for opportunities to help customers after a hailstorm or major weather event but by no means do we try to pressure customers into having a false sense that we are the ones to help them. MVP prides itself as being a local family owned company that builds lasting relationships with its customers. We look forward to helping you with your roofing needs. Give us an opportunity to show you that we are the right choice when it comes to your home. We offer services that we feel are second to none and take pride in knowing that no matter what the situation is we will do whatever it takes to put the customer first. MVP Contractor Stronger Than Ever! Information to help us with your service needs.MVP Stronger Than Ever!